"BRAVO! 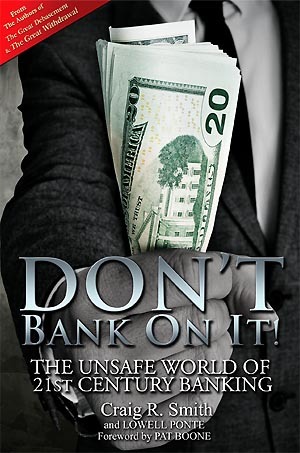 In Craig Smith and Lowell Ponte's newest book, DON'T BANK ON IT! they have successfully torn down the facade of America's most deceptive financial institution - modern mega-banks - and yet somehow also made it interesting, understandable and actionable reading." "In this book my long-trusted friend and advisor Craig Smith and former Reader’s Digest Roving Editor Lowell Ponte explain why your bank account is now punished and discouraged with near-zero interest, yet is at risk of being looted in at least 20 different ways." QUESTION: Could the bank we trust to safeguard our money now be one of the riskiest places to put it? DON'T BANK ON IT! will take you on nine thought-provoking journeys into the past, present and future perils of banking to show why it is no longer logical or wise to put your life savings in unsafe bank accounts. 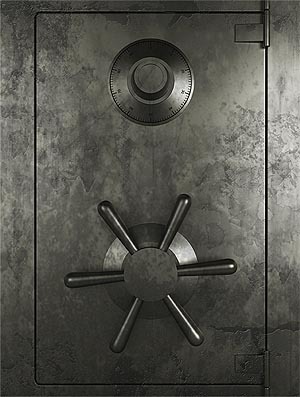 In CHAPTER ONE, we might still think of ourselves as living in the Wild West of steel safes and bank robbers like Jesse James, yet even the James-Younger Gang was defeated in its most famous attempted heist by their ignorance of a new technology. We, almost 140 years later, live in a very different, almost-cashless society where our money increasingly exists merely as flickering electronic impulses inside computers and global networks. We show how Jesse James today could not steal your savings or identity, yet hackers and cyber warriors might be able to rob you within milliseconds from the far side of the world. CHAPTER TWO explores how banking and money evolved together as two intertwined depositories of value, and how the universal money of gold and silver was transformed into government-issued debased coins and paper bills that rulers to this day continue to manipulate to rob their citizens. CHAPTER THREE shows how the looting of private bank accounts by English kings led to fractional-reserve banking, the fragile and unstable way our banks work today. This lucrative innovation has added a huge, sometimes-fatal amount of risk to modern banking. It, more than anything else, is why our banks now undergo "stress tests," tests that if scored honestly would usually fail. CHAPTER FOUR reveals how the unstable economy caused by fractional-reserve banking was used to justify the imposition of the Federal Reserve System in 1913. The Fed's real aim, as members of Congress warned, was to centralize political power over our banks and currency. We will show how the internal contradictions of Federal Reserve policies have today trapped America's banks and economy in what we call the "Fed Paradox." CHAPTER FIVE exposes how the abuse of the regulatory power over banking led to the near-collapse of our economy in 2008, caused the Great Recession, produced the boom and continuing bust in housing, and is giving us a slower, sicker "recovery" than even what followed the Great Depression. CHAPTER SIX looks at how the U.S. Government is extending its regulatory and taxing power over the entire world banking system. We look at the 2013 take-down of one island tax haven and a government official's declaration that these tactics are a "template" for how private bank accounts will be seized elsewhere in the near future. America's July 1, 2014 strong-arm move to crush small tax havens around the planet should be an ominous warning that the exits are being closed because savers will soon be trying desperately to escape from their bank accounts here. CHAPTER SEVEN reveals how the world's money-hungry governments are planning to take - and already are secretly taking - your bank savings. We show you the Obama Administration's sinister "Operation Choke Point" and other grabs for power over our banks. We will show how the government may be plotting to confiscate IRAs, 401(k)s, and other retirement accounts "for your own good," as has already been happening in other countries and the coming "world wealth tax". CHAPTER EIGHT shows the choice we face over banking's future. Banks as we have known them are about to disappear in the cashless global society that is dawning. We explore how the nationalization of our banks could happen, and what a future of the government politically and ideologically controlling all money and credit could be like. We are already far closer to this Orwellian future than most Americans know. CHAPTER NINE offers an alternative that you could bank on that combines old- fashioned security and sound money with convenient advanced technologies. In this brighter potential future that you can choose, honest money returns as a store of value, prosperity reawakens, and you might even become your own banker with your own gold standard. Our EPILOGUE 'THE GAMBLE' summarizes the 20 reasons our investigation has found as to why it no longer makes logical sense to keep most of your money deposited in a bank account. We also suggest ways to diversify and protect your money against the breakdown of the old banking system and dollar that is now inevitable....a question only of when, not if. It also challenges you to TEST what we have found out about the kind of 21st Century bank you now trust with your money. The results of this test might frighten you. It could certainly open your eyes. After reading this book, you will never again be able to see your bank, or the U.S. Dollar, as you did before. You are about to take a journey of ideas and information that crosses thousands of years and many lands. Fasten your seatbelt. It's going to be an eye-opening and surprise-filled ride.